I couldn't disagree more! I think it's really cool, very difficult to do, and probably expensive. The colors are quite conservative and tasteful. I like it a lot. Once a symbol for all things chav, Burberry had successfully re-branded itself as one of the UK's most sophisticated fashion labels. 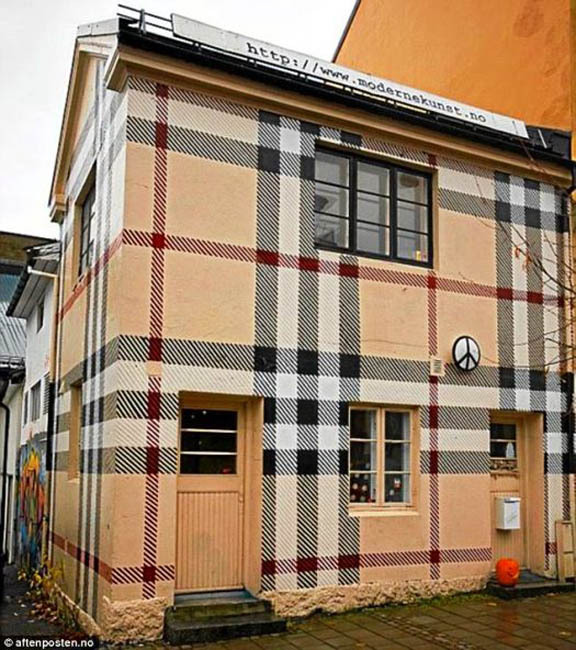 But a Norwegian artist looks set to undo all of their hard work after painting the exterior of his house - a former public toilet - in the brand's signature check. Jens Werner, 33, covered the entire building in the famous beige, black and red tartan design. The re-painting of the building in Larvik took several weeks at a cost of thousands of pounds. How in hell is this house going to, "undo all of their hard work"? I don't understand what the Mail online is all in a lather about? It's a very plaid house. The Mail exists in a permanent state of lather. my first thought was "Chav". Totally not my cup of tea, spectacular achievement, but why pick a pattern so deeply associated with the dregs of English society? Pretty nice building for a public toilet. Around here they are plastic one-holers. It does have a pee symbol, though. I think it's u-g-l-y. And I agree about the poor neighbors. Makes my eyes go out of focus. Would this be considered a "tartan"? I'm painting my house with argyle sox.